Last week the Federal Aviation Authority in the United States issued a ruling which allows the airlines to expand the use of personal electronics during flight. 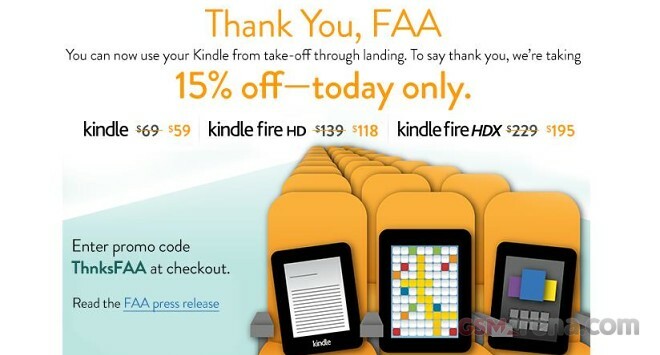 Today, Amazon decided to celebrate the occasion with a one-day sale of its Kindle family of tablets. Today only, users can snag an Amazon Kindle tablet with 15% off its regular price. The promotion is valid for the regular Amazon Kindle, the Kindle Fire HD, as well as the brand new Kindle Fire HDX. The last one is particularly attractive as it offers a package of Qualcomm Snapdragon 800 SoC and FullHD display for less than $200 today only.